In general, Atlanta’s real estate market has remained pretty steady recently. Average sale prices continued their YOY increase, rising 6.9% from where they were last year, while the number of closed transactions also saw moderate gains. One exception was the average list price, which reversed its downward course in August, and has continued to climb higher ever since. However, this month’s market trends reflect housing sales prior to the election; so it will be interesting to see how the results impact the market in the coming months. We’ve already seen mortgage rates jump up, so that could put a damper on home sales during the slower winter months. Video Summary - Length: 05:06 - The median sale price in Metro Atlanta rose 7.7% year over year to just under $210K, led by the median list price, which soared 8.9% YOY. The number of new listings also increased 4.4% YOY, yet the months supply of inventory still dropped. Homes are selling at a slightly higher discount than they were during the summer, but the sale price to original list price ratio still remains very favorable to sellers at 97.2%. The average number of days on market was down only marginally, but that was before interest rates skyrocketed post election. This month’s real estate tip should help buyers feeling defeated by the lack of inventory of homes for sale. The average sale price was up again last month, increasing 6.9% compared to October of 2015. In the past two years, we’ve seen prices drop in October (from the month prior), but this year the price actually went up month over month, if only slightly. It seems that the continued shortage of homes for sale and the demand from buyers has kept prices propped up. As you can see in the chart above, the average sale price leveled off in October; something similar to what it did around the same time three years ago. The overall drop off in sale prices seem to be less pronounced this fall than they've been in the past. This gives me a strong indication that prices have not reached their ceiling yet, and that they will continue to go up, especially once we get into the new year. The market finished strong in the month of October, seeing 4.7% more homes sold than the same period last year. As you can see in the chart below, numbers are up this year, but sales have tapered off from their summer highs, which is typical for this time of year. Although home sales are up in Atlanta, they're not quite on par with national trends. According to recent figures published by the National Association of REALTORS®, nationwide home sales in October rose 5.9% from a year ago, reaching a seasonally adjusted annual rate of 5.6 million. This was the highest number of sales the U.S. housing market has seen since February of 2007. As I was out showing properties the other day, I couldn’t help but notice plenty of yards with for sale signs in them. If you didn’t keep track of this stuff like I do, you might think the inventory of homes for sale is pretty good. Well, I’ve looked at the numbers, and the inventory just isn’t growing. Not that it’s a terrible thing to have low active inventory, I just prefer a more balanced market. As you can see above, there were 24,203 active listings in October. This represents a 3.8% drop from a month earlier, and a 7.3% decline from October 2015. We’ve seen the number of new listings consistently grow, but so many of these homes are under contract very quickly, therefore they’re no longer considered active inventory, then they close. This shortage has played a major role in driving home prices back up, and clearing out distressed properties. In past years, average list prices tended to peak around April or May, then gradually fall off until the end of the year. This makes sense, as your most of your prime properties are listed for sale just before the summer, so they can take advantage of the hot spring/summer market. However, last year we had two months where prices broke the mold, and this year we’ve experienced a reversal of the downward trend, starting in August. As of last month, the average list price was just under $332,000. This was more than $16,800 higher than it was a year ago; approximately a 5.34% YOY increase. In an environment where homes are selling quickly and available properties are in short supply, expect this number to increase. As I explained in the video above, buyers have been willing pay close to list price, even as the asking price climbs. You’ll notice in the chart below, that, generally speaking, the median number of days on market has remained pretty consistent over the past two years. This has been the case since early 2013, when the market completed its shift from a buyer’s, to seller’s market. While the median days to contract was down five, the median days from contract to sold increased by one. The net change resulted in homes selling in 65 days in October of 2016, versus 69 days in October of last year. I’m actually surprised to see the median days from contract to settle is as low as it is. In my experience, many closings are currently being delayed due to longer loan processing times. Despite their best efforts, many lenders have been unable to close loans any quicker than 35-40 days. 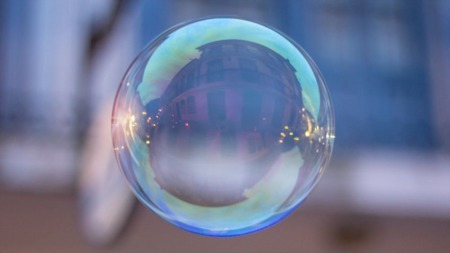 This makes me wonder if a higher proportion of homes are being purchased with cash, since cash deals can close much quicker than those that involve financing. It’s not out of the question for a cash sale to close in 7-10 days! The price per sq/ft of active listings in Metro Atlanta continued to climb last month. Hitting another high, the average price was $137. This was 12.3% higher than it was in October of 2015, when it was $122 per sq/ft. Nearly five years ago, homes were priced at $89, so you can see just how much list prices have increased. The average sale price per sq/ft also hit a high, finishing up October at $117. This was 9.3% higher than it was last year ($107). Even though average sale price metrics are usually higher, the median price has also experienced a YOY jump. In October, the median sale price per sq/ft remained at $102… a high mark that was first hit in May of this year. At $102, the median price was 8.5% higher than it was a year ago. Again, the general trend has been consistently upward since early 2012. 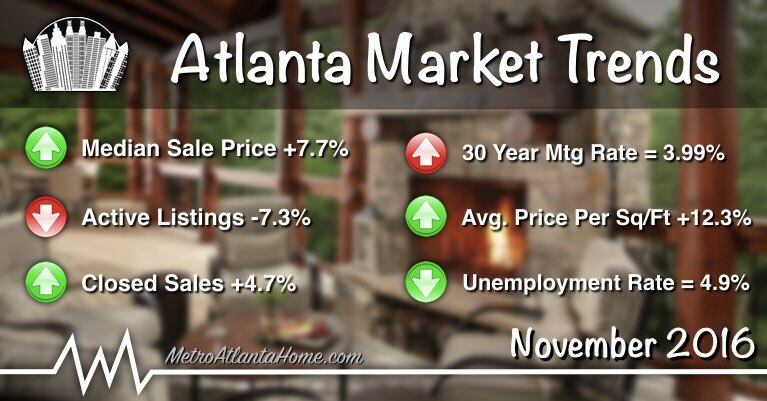 Current estimates show Atlanta home values are up approximately 7.8% in the past year. If you’ve been thinking about selling, now is the time to take advantage of this seller’s market. Need to know what your home is currently worth? Check out our home value estimator tool for a detailed analysis. This month I’m revising the numbers from last month’s foreclosure analysis. In order to improve the data accuracy in my monthly market updates, I won’t be able to use the most recent month’s data. When updating I was updating the foreclosure & REO numbers for October, I noticed September’s numbers had changed. It appears all the data was not included when the reports were initially put out. Why? Well, county records typically take about a month or so before they are recorded, so sales occurring late in the month may not be included. By waiting a full month before reporting the numbers, I can be sure that the majority of transactions are included in the data. So, as you can see below, foreclosures in September actually increased from a month earlier. REO transactions remained historically low at only 114 sales for the month. Either way, distressed sales remain a small portion of the overall number of sales. However, they’re definitely worth keeping an eye on, as a continued upward trend could signal a pending shift in the overall market. Note: Monthly foreclosure and REO sale data was obtained from Bridge Interactive Group. Our analysis and chart above are based on real estate data from the following counties: Barrow, Bartow, Carroll, Cherokee, Clayton, Cobb, Coweta, Dekalb, Douglas, Fayette, Forsyth, Fulton, Gwinnett, Hall, Henry, Newton, Paulding, Rockdale, Spalding, Walton. Mortgage rates have been a hot topic in the news lately. Immediately following the election earlier this month, mortgage rates spiked for nearly every loan type. The biggest jumps were seen in twenty and thirty year conventional loans. Notice in the chart below, rates have increased a half percent from the end of October to the end of November. That’s quite a jump! During the month of October, mortgage applications increased 8%, relative to October of 2015. But with interest rates going up in the weeks following the election, home purchase mortgage applications have gone down. However, there has been an increase in overall purchase volume, which recently hit an all-time high of $310K, according to a November 23rd press release from the Mortgage Bankers Association. It looks like many homebuyers are moving forward with buying property, likely looking to avoid additional increases in interest rates. Metro Atlanta’s employment numbers continue to improve, experiencing another tenth of a percent drop in October. This means the unemployment rate was four tenths of a percent lower this year than it was last year. In addition, unemployment insurance initial claims also plummeted in October. Last month, there were 11,542 claims, this compared to 13,780 during the same period last year. Therefore, claims dropped 16.2% year over year, despite a small increase of 0.9% from the month prior (September ‘16). 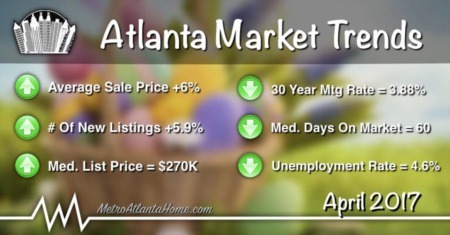 Alpharetta: Last month there were 203 (+10.3%) homes sold in Alpharetta at an average sale price of $373,459 (+6.2%). The average days on market was 52, up from 51 a year ago. The number of new listings increased 6.2% to 256, putting the number of total active listings in Alpharetta at 613 (+10.5%). Currently, the average list price in this area is $488,172 (+6.3%), at a price per sq/ft of $148 (+5%). Avondale Estates: Last month there were 13 homes sold in Avondale Estates at an average sale price of $347,608 (+46.9%). The average days on market was 94, up from just 11 a year ago. The number of new listings increased 29.4% to 22, putting the number of total active listings in Avondale Estates at 31 (-24.4%). Currently, the average list price in this area is $413,082 (+35.8%), at a price per sq/ft of $184 (+21.1%). Brookhaven: Last month there were 70 (+12.9%) homes sold in Brookhaven at an average sale price of $493,865 (+14.7%). The average days on market was 43, down from 54 a year ago. The number of new listings increased 10.6% to 115, putting the number of total active listings in Brookhaven at 284 (+25.1%). Currently, the average list price in this area is $531,614 (-2.4%), at a price per sq/ft of $213 (+5.4%). Buckhead: Last month there were 178 (+11.3%) homes sold in Buckhead at an average sale price of $564,717 (+6.4%). The average days on market was 73, up from 58 a year ago. The number of new listings increased 5.7% to 258, putting the number of total active listings in Buckhead at 872 (+10.5%). Currently, the average list price in this area is $899,348 (+14.5%), at a price per sq/ft of $293 (+12.3%). Chamblee: Last month there were 19 (-13.6%) homes sold in Chamblee at an average sale price of $314,132 (+6.5%). The average days on market was 15, down from 53 a year ago. The number of new listings decreased 3% to 32, putting the number of total active listings in Chamblee at 48 (+11.6%). Currently, the average list price in this area is $343,530 (+8.5%), at a price per sq/ft of $179 (+1.1%). 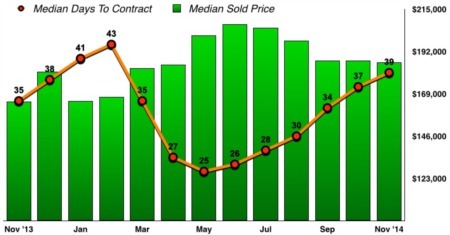 Decatur: Last month there were 40 (-14.9%) homes sold in Decatur at an average sale price of $402,886 (+6.6%). The average days on market was 50, up from 45 a year ago. The number of new listings decreased 1.3% to 76, putting the number of total active listings in Decatur at 109 (-11.4%). Currently, the average list price in this area is $512,434 (-1.5%), at a price per sq/ft of $241 (+6.2%). Doraville: Last month there were 8 homes sold in Doraville at an average sale price of $191,138 (-13.9%). The average days on market was 20, down from 22 a year ago. The number of new listings increased to 10, putting the number of total active listings in Doraville at 9 (-57%). Currently, the average list price in this area is $193,340 (+34.5%), at a price per sq/ft of $120 (+25%). Duluth: Last month there were 102 (+22.9%) homes sold in Duluth at an average sale price of $299,381 (+11.1%). The average days on market was 45, up from 43 a year ago. The number of new listings decreased 12.1% to 109, putting the number of total active listings in Duluth at 285 (-10.1%). Currently, the average list price in this area is $356,130 (+2.5%), at a price per sq/ft of $118 (+8.3%). Dunwoody: Last month there were 59 (+34.1%) homes sold in Dunwoody at an average sale price of $378,587 (-1.1%). The average days on market was 42, down from 60 a year ago. The number of new listings remained steady at 63 (0% YOY change), putting the number of total active listings in Dunwoody at 151 (+2.7%). Currently, the average list price in this area is $461,455 (+2.8%), at a price per sq/ft of $177 (+5.4%). Johns Creek: Last month there were 102 (+6.3%) homes sold in Johns Creek at an average sale price of $399,641 (+2.3%). The average days on market was 55, down from 56 a year ago. The number of new listings decreased 4% to 143, putting the number of total active listings in Johns Creek at 421 (+10.8%). Currently, the average list price in this area is $601,838 (+23%), at a price per sq/ft of $156 (+9.6%). Lilburn: Last month there were 67 (+19.6%) homes sold in Lilburn at an average sale price of $233,429 (+11.2%). The average days on market was 36, down from 55 a year ago. The number of new listings increased 5.9% to 90, putting the number of total active listings in Lilburn at 179 (-23.8%). Currently, the average list price in this area is $224,827 (+5.3%), at a price per sq/ft of $96 (+11.6%). Norcross: Last month there were 74 (+39.6%) homes sold in Norcross at an average sale price of $183,121 (+10%). The average days on market was 29, down from 38 a year ago. The number of new listings decreased 2.4% to 82, putting the number of total active listings in Norcross at 130 (-30.1%). Currently, the average list price in this area is $195,769 (-5.1%), at a price per sq/ft of $100 (+9.9%). Roswell: Last month there were 127 (-9.9%) homes sold in Roswell at an average sale price of $369,307 (-4.5%). The average days on market was 55, up from 49 a year ago. The number of new listings increased 15.4% to 172, putting the number of total active listings in Roswell at 433 (+3.6%). Currently, the average list price in this area is $461,153 (+13.8%), at a price per sq/ft of $160 (+18.5%). Sandy Springs: Last month there were 114 (-13%) homes sold in Sandy Springs at an average sale price of $488,285 (+25.1%). The average days on market was 58, up from 50 a year ago. The number of new listings increased 6.9% to 231, putting the number of total active listings in Sandy Springs at 598 (-1%). Currently, the average list price in this area is $862,347 (+56.1%), at a price per sq/ft of $204 (+22.2%). Tucker: Last month there were 32 (-23.8%) homes sold in Tucker at an average sale price of $227,261 (+6.3%). The average days on market was 45, down from 46 a year ago. The number of new listings increased 2% to 52, putting the number of total active listings in Tucker at 127 (-16.4%). Currently, the average list price in this area is $246,891 (+15.5%), at a price per sq/ft of $108 (+14.9%).